Happy Halloween from the future starting outside linebacker of Pittsburgh Steelers. Note the 'shoulder pads' (two pairs of my socks, actually) and of course the eyeblack! Bedell Cellars has produced a new video and they've actually been smart enough to post it on YouTube. Long Island wines have been slow to embrace new and social media...but there are baby steps being made. 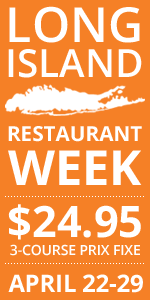 The third annual Long Island Restaurant Week begins this Sunday, November 2 and runs through Sunday, November 9. Participating restaurants will offer a three-course prix fixe dinners for $24.95 per person all night, except Saturday, when it will only be available until 7 p.m. Each restaurant offers its own unique menu... and hopefully this year restaurants won't go crazy withe supplements for special courses (which isn't in the spirit of the event at all). With the little guy at home, it's hard for Nena and I to take advantage of this program, but I'm hoping we can sneak out, maybe even with him, to at least one restaurant. You can see a list of participating restaurants on the event's site. In today's clip, long-time grapegrower Jim Murphy talks about a variety of topics including yields, frost and pruning. Congratulations to Dr. Konstantin Frank Vinifera Wine Cellars, Wolffer Estate, Bedell Cellars, Lenz Winery and Paumanok Vineyards for placing first through fifth on the "Greatest Wine Producers" list for the Atlantic Northeast region in Tom Stevenson's "Wine Report 2009." Dr. Frank's has now taken top honors for the past fives years. 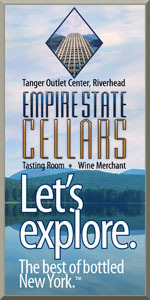 It's hard to argue with any of the wineries on the list and the composition of the list shows that New York has clearly positioned itself as the eastern state if you're looking for quality wine. 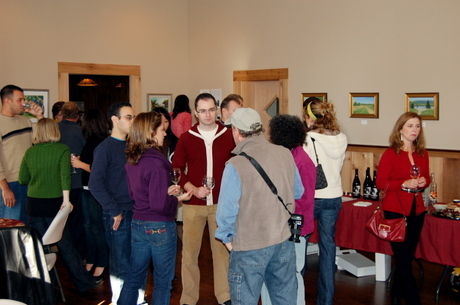 I've had wines from Chaddsford (some were good) and L. Mawby (liked those better actually) but not the other wineries. Has anyone tried them? Veteran grape grower Jim Murphy talks about vineyard lifecyles and machine harvesting. There will be several posts about the recently completed Wine Bloggers Conference out in Santa Rosa, but I thought I'd start with what was one of my favorite parts -- the vineyard walk. We had several different vineyards we could walk/hike and after deciding to take the easy route and pick one of the flatter, shorter walks, I was harassed by two of my in-shape WBC friends (namely Erika and John) into joining them for the most strenuous one. "Alexander Valley North: This walk starts at the Geyserville Inn, heads across the Russian River and through vineyards and farmland to the hillside property of Rodney Strong’s Rockaway Vineyard. Participants will be accompanied by long-time grape grower Jim Murphy. This is the longest walk option and is perhaps four miles." I'm not going to lie... I was pretty winded winded at several points along the hike from 200 feet above sea level to 750, but it was worth it. In addition to hearing from Jim Murphy, we also met and learned from Rodney Strong's director of grape growing Doug McIlroy. Best of all, perhaps, were the gorgeous views of the Alexander Valley and having the opportunity to interact with fellow bloggers in a casual, fresh-air setting. We had extra motivation as we headed up the final stretch to the top of Rodney Strong's Rockaway Vineyard... the promise of a hilltop lunch and a taste of their new flagship wine, a cabernet sauvignon blend known simply as Rockaway. Of course, after sweating and hiking in the hot California sun, we weren't too anxious for that cab. Thankfully, they were pouring both a sauvignon blanc, which was tropical and round with just enough acid, and a chardonnay that simply had too much oak going on for my tastes. Lunch was delicious and once we had all cooled off in the shade, we were ready to taste the Rockaway. Everyone knows that I'm not a huge fan of big Cali cabs, but this was one that I can appreciate for it's power and intensity. Just some of the Long Island wines poured at the hugely popular New York wine after party. The crowd enjoying said New York wines. More pictures from this hike tomorrow...and some video too. This was at the top where we had lunch and some wines from Rodney Strong. Well, I was supposed to be pouring for this portion of the event, but the wine I was supposed to pour seems to be MIA. Kantzler Cellars 2007 Pinot Noir (Barrel Sample). Spring of 2009 release. 420 or so cases. Big extraction, getting lots of strawberry, cherry and cocoa powder, toasty, pencil lead...I REALLY like this one. (3:57 p.m.) Will retail for $48. Clos LaChance 2005 Estate Cab Sauv. Inky extraction. Soft, big fruit. Simple, but nice. Retails for $30. Okay. I'm taking a break from trying to type while I taste these... more later. While I've been off promoting my new book, The Beer Hall Guide to Long Island, the beer scene has been moving and shaking. There are many opportunities coming up and going on where the beer-curious drinker to find and taste some excellent beers and to improve their beer knowledge. The Long Island Beer and Malt Enthusiasts are now hosting a series of beer "study" sessions (once a month on a Thursday, see the Long Island Beer Calendar) where beer experts and novices come together at one table to taste and discuss the history and qualities of a particular beer style. Long Island also has a beer tradition that I've not seen in other parts of the county (at least at the level that we take it): pumpkin ale season. Each September the Island's breweries release their take on a pumpkin flavored ale and we can't get enough it seems. If you have never had a pumpkin ale, you should know that there is a wide variation in the quality of the different versions out there. Some brewers gimmick-up their pumpkin ale with a sugar and spice rim. This tasty flourish hides, rather than reveals the pumpkin flavor. True pumpkin ales will be able to stand on their own and go down pleasantly without the aid of a sweetener. One such pumpkin ale is the Pumpkin Ale from Southampton Publick House. Next Friday on Halloween, you'll be able to try cask conditioned Southampton Pumpkin Ale at DEKS American Restaurant in Rocky Point. The firkin will be tapped at 6 p.m. and anyone in costume will get their first pint on the house. Don't miss out on this opportunity to try a fantastic pumpkin ale direct from the cask. 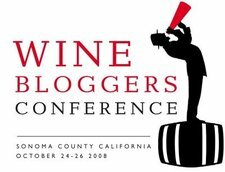 Tomorrow morning I'll be on a flight from JFK to Oakland, where I'll hop in a rental car to drive north to Santa Rosa to attend the first annual Wine Bloggers Conference this weekend. Normally on a trip such as this one, I'd be warning you about a period of blog silence, but I plan to be doing regular updates throughout the day and then also in the evenings. It's going to be a lot of fun meeting (in person) many of the people I've gotten to know as a part of the wine blog community over the years. I'm sure there will be plenty of good wine to taste as well. The only thing that would make this a better trip would be if Nena and Jackson were coming with me. Although Ravines Wine Cellars is located on Keuka Lake, owner-winemaker Morten Hallgren crafts his wines using space at Shaw Vineyard, located a few miles to the east on Seneca Lake. Hallgren and Steve Shaw, winemaker and owner of Shaw Vineyard, work independently but of course try to coordinate production schedules to enhance services and manpower. Before the fall harvest, Steve Shaw invited me over to the winery to watch as he bottled some of the reds wines from both wineries. I was interested to check it out because both winemakers use a mobile bottling line, an operation that I thought would be a delight to witness. I was not disappointed. The mobile unit, owned and operated by Peter Oughterson of Highland Cellars, is a marvel of efficiency, cramming all kinds of machinery in a medium-sized rig that would otherwise have taken up quite a bit of floor space in a winery's facility. As I scurried around, poking my head in various openings through both sides of the truck, the bottles moved through the long, narrow gauntlet of moving parts, being filled with wine, getting corked, and finally emerging with shiny new labels identifying the contents. 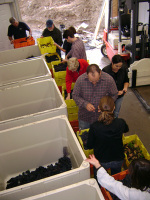 During my visit, I witnessed the bottling of Morten's 2007 merlot, the first varietal merlot that he has bottled. Last spring, I had the pleasure to taste the individual lots that went into this wine, and came away impressed by the robust, ripe, fruit, backed with solid structure and smooth tannins. The final wine is impressive, with a full body that belies the wine's regional origin. The months of heat and drought during the summer of 2007 are relative rarities in the Finger Lakes region. I suspect that some of the red wines from the vintage will excel far beyond normal expectations. I also had a chance to taste Morten's 2007 Meritage blend which was in queue for the bottling line. Like his previous bottlings, it showed a great deal of balance with multiple layers of flavors and aromas. It tasted young, but the fruit potential was there, and I'm looking forward to this one much like the 2005, which it may even surpass. Steve Shaw had already bottled some his reds the day before my visit. Surprisingly, Steve was not bottling his 2007 reds... he was bottling his 2005s! Actually, I don't know for sure that the block of chardonnay that Wolffer Estate Vineyards' Richie Pisacano harvested earlier this week was the very last bit of chardonnay to be harvested, but he certainly let it hang longer than most... if not everyone else. "Yes, chardonnay is off and beautiful. This Dijon block always gets me pumped. I think of it as a great example of the right variety/clone/rootstock on the perfect spot that crosses the finish line every year. Keep a look out for the 2008 Pearle (chardonnay). I think this will likely turn out to be a great one. The long hangtime paid big dividends in the flavor department." Vineyard managers, winemakers and wineries in general are always playing a balancing act during harvest season. It's ripeness and flavor development against Mother Nature. The quality-focused wineries are always pushing, trying to get as much sugar and as much flavor complexity as they can... before frost or disease wipes out the fruit entirely. On Long Island and in other cool climate regions, you just can't play it safe and make great wines. I just heard, through our very own Melissa Dobson, that it is snowing in the Finger Lakes today, with more snow expected tomorrow and later this week. That means that there will be a LOT of harvesting today. I'll keep you posted as I hear and learn more. I leave for Wine Bloggers Conference 2008 Friday morning, but it almost feels like I'm already there because Melissa Dobson and I have been working with wineries from throughout New York to compile a bunch of New York wines for us to pour while we're in Santa Rosa for the event. There are still a few stragglers coming in, but we've finally been able to finalize most of the wines that will be available. Most of these wines are samples coordinated by me, Melissa and a couple different regional associations. Several did come from my own cellar and both Melissa and I have paid to ship the wines cross-country ourselves. As I said...more wineries keep offering to ship wine out, so this list will likely grow. And, several wineries offered more than one wine and if I have room in my suitcase for them, there will be even more. How Will Riesling Clone N90 Improve Riesling Quality? As a follow up to Lenn's mention of Dr. Konstantin Frank Wine Cellars' announcement of the release of Riesling Clone N90, I had the opportunity to interview Frederick Frank, President of Dr. Frank's, to get more detail on the project and its significance. Melissa Dobson: Tell me about how the Riesling Clone N90 project was created. 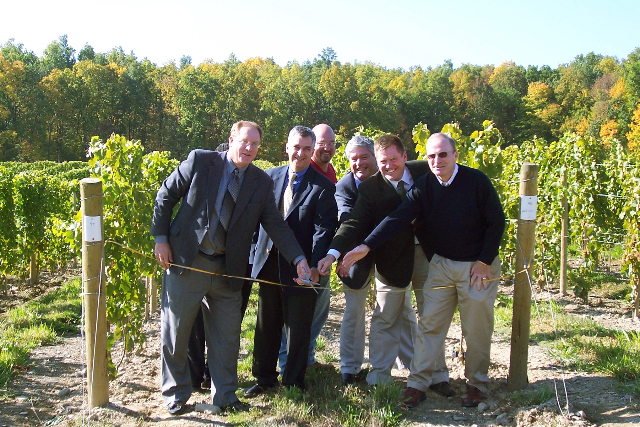 Frederick Frank: After experiencing several record cold winters in 2003 and 2004 my father, Willy, and I discussed pursuing the importation of some virus-free clone N90 riesling vines from the Neustadt Research Station in Germany. We wanted to import grafted vines that were rooted to insure that the vines were virus free and crown gall free. We hoped to establish a mother block which we could use for future propagation for our vineyard expansion and have available for other vineyards. This project took several years to implement and required the cooperation of the USDA, New York Agriculture & Markets, Cornell University and the Neustadt Research Station. MD: Why is the release of riesling Clone N90 important? FF: According to Dr. Marc Fuchs at Cornell University, there is a high percentage of riesling vines in New York that are infected with virus diseases and also crown gall bacteria. These weaken the vine resulting in lower winter hardiness, lower sugar levels in the grapes and therefore lower potential wine quality. By starting out with the best riesling clone and ensuring that the vines were virus free and crown gall free we felt that the quality of Finger Lakes riesling would be improved. The riesling Clone N90 has improved winter hardiness, greater potential wine quality with enhanced aromatics and greater disease resistance due to looser bunches. MD: What does riesling Clone N90 mean for Dr. Frank’s Winery? What does it mean for the Finger Lakes region? And what does it mean for the wine world overall? FF: I believe that by planting future vineyards with virus-free and crown gall-free riesling Clone N90 vines we will improve the quality of our vineyards and therefore the quality of our wines. This will result in healthier vines that will have greater resistance to winter cold and be more disease resistant. We will be able to offer these Clone N90 vines in the future to other vineyards. MD: What are the benefits for consumers and will they notice a difference in wines made with riesling Clone N90? Can you explain these differences? FF: Wines made from riesling Clone N90 will have a slightly higher alcohol level due to higher sugar levels in the grapes. The wines will have enhanced aromatics and have a typical riesling character. FF: My dad, Willy, was the guiding force behind this project. He passed away before we received the approval to import the vines and he would have been very proud to have witnessed their release approval. Like his father before him he did not take "no" for an answer but rather took it to be a challenge to work harder to overcome the obstacles. I am grateful to the cooperation we received from the USDA, New York State Dept. of Ag. & Mkts., Cornell University and Neustadt Research Station. When it comes to Halloween, wine isn't the first thing you think about. Okay, with things like jack-o-lanterns, costumes, candy, trick or treating and the like on the table, it's probably not the second, third or fourth thing either. But, I've found one wine that should be on the bar at any (adult) Halloween party, if there really is such a thing. And it doesn't even come from New York. It hails from a lesser-known region of California called Calaveras County and a unique producer called Twisted Oak Winery, a winery that eschews the grapes California is best known for, cabernet sauvignon and chardonnay, and instead focuses mostly on Spanish-style wines using grapes like Tempranillo, Garnacha and Graciano. 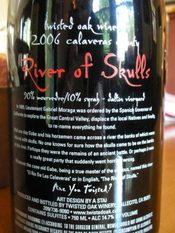 Just look at the label on Twisted Oak Winery's 2006 River of Skulls ($35)! The eery red skull alone would look great at any Halloween party. But this is no made-for-Halloween plonky wine. Yeah, the name of this 90% Mourvedre, 10% Syrah blend might seem a bit gimmicky, but there is a story behind it. This isn't a made-for-Halloween wine like the Vampire Pinot Noir we've all seen on store shelves. You see, the name is really a raise of the glass to the history of the region where the grapes were grown. In 1805, a Spanish Lieutenant who was exploring the area found a number of skulls scattered along on the river bank. He named the place "El Rio De Las Calaveras" which means "River of Skulls." 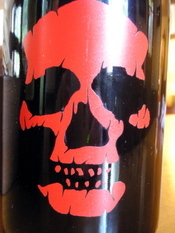 A dark, rich crimson-ruby in the glass, the River of Skulls clocks in at 14.9% ABV. This is a young wine, but with swirling, alluring aromas of overripe blackberry, black cherry, leather, star anise, black pepper, Allspice, and vanilla rise from the glass like fumes from a witches bubbling cauldron. The palate is hefty and mouth-filling with flavors of blackberries and black cherries and a sprinkling black pepper and sweet spice, sweet oak, cigar box and fine leather. The finish is long and a little smoky-sweet, with fairly firm -- though well integrated -- tannins and a little bit of acidity that provide a sturdy frame for this flavor-filled wine. River of Skulls is only available via an allocated mailing list, but the list still seems to be open. Visit www.twistedoak.com to sign up or to learn more about this great little winery. As we begin to sort through our pinot noir with some new volunteers, I am continually asked, "So, does every winery sort through each cluster of grapes?" The quick answer is "No", but there is a much more complicated answer as to why. There are essentially two ways to harvest the grapes -- by hand or by machine. Hand harvesting is a labor-intensive process, raising the cost of each ton of grapes. The other alternative is a machine harvester -- which costs a pretty penny initially, but those costs spread across several years (and the harvester doesn’t get tired hands). The harvester can move through a vineyard quickly while shaking the berries and collecting them into the accompanying bins. It should also be stated that vineyards throughout the world use harvesters to pick their fruit. So why would you go through the effort of hand picking if it is more time consuming and has a higher cost? Fruit Quality: With hand-picked grapes, you can easily spot sour rot, or other undesirable things and remove them when sorting. This can be done in the field or at the crush pad and we’ve made the decision to do both to ensure that only the best possible fruit finds its way into the bottle. Going out on a limb here, I would guess that most of the great wines of the world utilize hand picking and some form of sorting when selecting their fruit. Gentle Control: Some fruit does not like to be bashed into a pulp before arriving to the crush pad. Pinot noir is one of those varieties that is not forgiving of a heavy hand. MOG: Mog is "material other than grapes." For the harvester to get the berries off the vine, it has to use tiny beaters to shake the vine and drop the material into a basket. Anything on the vine, and I mean anything that happens to be unlucky enough to be in the harvester path that day, is sent into the bin. Bugs, birds, snakes, mice, staples, leaves, vine shoots, weeds all have their way of making it into the bin. Now, I know what you’re saying… “But all that stuff gets sorted out once it arrives to the winery, right?” Well, I’m sorry to say, not exactly. If the winery has a sorting table, probably 99% of the MOG gets removed. If the winery does not have a sorting table, the destemmer does a pretty good job of kicking out the larger stuff – the twigs, stems, and fat varmints are not able to make it through the berry holes on the destemmer. The rest of the stuff moves to a tank to be fermented or directly to the press. I won’t go into too many details, but after seeing squished mice come out of a press, you have a greater response to caring for the end product. The bottom line is, you are probably getting what you pay for. It’s cheaper and faster to machine harvest a block of grapes, and that savings is usually passed along to the consumer. As you can see, the techniques involved in making higher quality wine deserve a bit of a higher price tag. So with the next wine you buy, don’t be afraid to ask how the wine was made to learn what’s in your wine. From Fion: Hand Sorting after the jump. "Mommy, where do 89 wines go when they die?" The question in the title is not flippant: the ever-frustrating 89-point score is a non-starter in terms of soliciting national interest in a given wine. If Wine Spectator graciously grants a 90-point rating, the wine flies off the shelf. An 89, despite its proximity to 90, results in mediocre interest at best. The problem is even more vexing for wines from lesser-known regions. An 89 for a well-known California producer will not deter loyal consumers en masse, but the same score for a New York, Michigan or Virginia winery means that the millions of wine drinkers who have yet to even try a wine from one of these regions will, yet again, pass on the opportunity. But what is an 89-point wine? Can it be that much worse than a 90-point one? Since wine tasting and scoring is an art, not a science, is it possible that an 89-point wine is no less worthy of attention than a wine that scores one measly point higher? What if, as has been pointed out by me, Lenn, and others, there exists the possibility that editorial bias restricts some major publications from giving 90+ scores to certain regions without the cache of Napa, Bordeaux or Rioja? The number of Finger Lakes rieslings, for instance, that pile up against the 89-point ceiling in a single tasting round is noteworthy. To explore these general concerns about the 89 phenomenon, the 89 Project blog takes a look at various 89-point wines from around the world, trying to etch away at our psychological predisposition to embrace 90 but reject 89 as something altogether inferior. David Honig, the 89 Project's founder, puts the emphasis in sports terms: "They are a receiver's foot near the sideline in the last minute of a championship game. They deserve instant replay if, for no other reason, just coming close." Any 89 score is of course just one opinion. Project 89's site is filled with wines that may have been under-evaluated because, as Honig puts it, they are from "Loire, instead of Burgundy, or Santa Rita instead of Napa." The possibility also exists that some wines are given a charity 89 simply due to reputation, and perhaps deserve far lower scores. As those of us observing the New York wine industry both celebrate and shake our heads at the multitude of 89s coming our way, it is important to consider that we should do our best to promote our 89 wines (and maybe those 88s as well). These just might be our gems, victims of a 100-point scale that is more of an editorial hatchet than a real judgment tool. In honor of the 89 Project, Lenn and I are working on developing a growing list of 88-89 New York wines that takes into account both the perspective that no consumer should be a slave to the 100-point scale and that the market reality dictates that we continue to pay attention to these scores anyway. Many wine enthusiasts, including myself, believe that the 100-point scale takes some of the fun out of evaluating and judging wine. We may be right, but at the end of the day wineries need to sell their stuff, and for millions of American wine drinkers a 90 or a 91 is what is needed to inspire experimentation. If framed positively an 89 score is better than no score at all, and there must be a market for those who see value in being just a little bit cynical toward the whole system.